One of the best-known walks in Tasmania, the Dove Lake Circuit is also the most easily accessible short walk in the Cradle Mountain region, with the Crater Lake walk a close second. At just 6 km, the flat, gravel and duckboard track is very easy going, leaving you to focus entirely on the jagged peak of Cradle Mountain, which looms above the track. Depending on the weather, which switches from snow to sleet to sunshine in seconds, Cradle Mountain can seem brooding or pastoral or inviting, and some days its twin dolerite spires are completely obscured. Along the way, there is a greater mix of terrain than one might expect for a walk of this distance, including scrubby button grass, sandy beaches, cascading streams and at the mid-point of the walk, a very special rainforest known as the Ballroom Forest. This enchanted stand of moss-covered myrtle-beech trees is the stuff of folk stories, and it is easy to picture magical creatures playing amongst its leaves. This image belongs to the travel and nature stock photo library. This stock photo of Sunrise at Lake Dove Boat Shed is available for licensing for commercial and editorial uses including websites, blogs, books, magazines, brochures and advertising. Restrictions may apply for images which contain third party copyrighted material or sensitive subjects. Photos of artwork are for editorial use only. 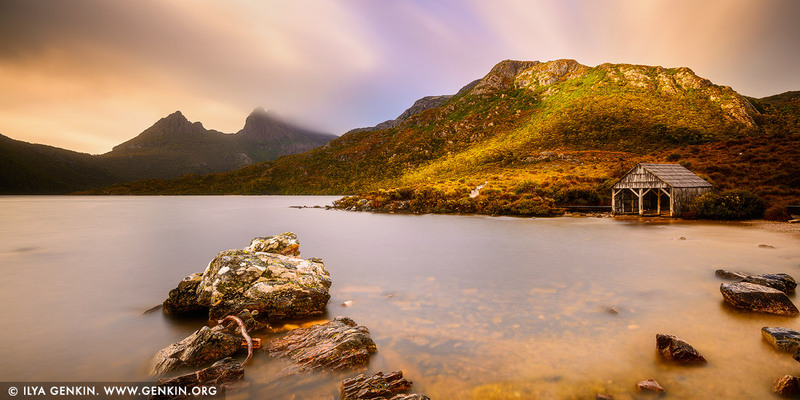 This image id CRADLE-MOUNTAIN-LAKE-DOVE-TAS-0005 of Sunrise at Lake Dove Boat Shed, is copyrighted © by Ilya Genkin. This is not a public domain image.